America has come so very far from the ideals in the Declaration of Independence. The Declaration is the ideal from which America was born – out of and with the help of Divine Providence. The Constitution was the first attempt to put into practice this ideal. 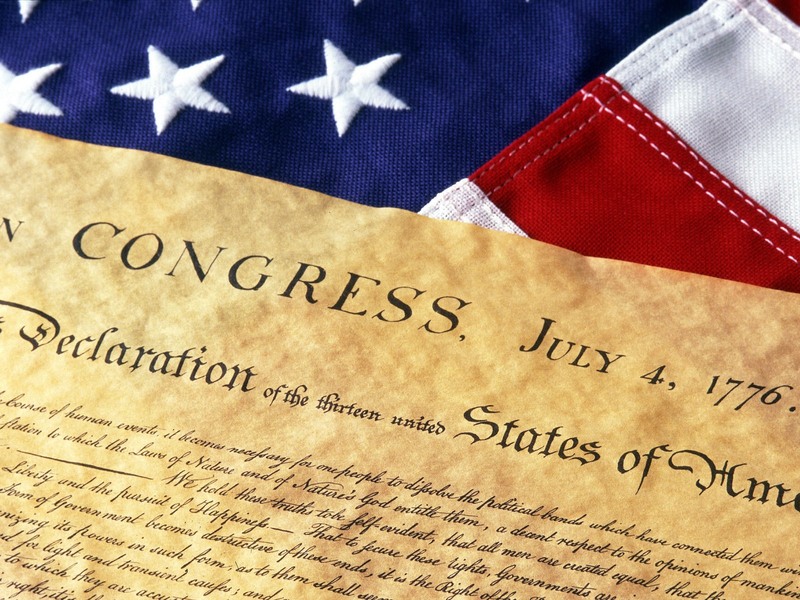 The Constitution cannot be understood outside of the light of the Declaration. Our liberty, our freedoms – according to the Founders – come from God. A Constitutional Republic must, as a matter of fact, have a moral standard, and ours always has. The biblical understanding of right and wrong has defined America’s morality long before our first President was sworn in. From the Mayflower Compact to how we educated our children in the early 1600’s in Jamestown, the laws and love of God has been at the center of who we are as America. Our Founders formed a government based on these biblical moral standards which are the fulcrum around which our laws and our system works. Under this way of life, poisons and threats to our way of life become easy to spot and defeat. Without moral clarity, victory becomes very hard to maintain and achieve. On this day, July 4th 2015, let us live up to the standards that our government, laws, and society have been established. As the threat of the growing Islamic Movement pushes in on decent and civilized society, it is time to stand firm, no matter what the cost. We have a federal government which has grossly exceeded its authority, violated the law, and demonstrated that individual liberty is not longer the cause for which it stands. No matter what an individual believes, the underpinnings of this nation were built on a faith in a loving and almighty God whose hand has guided us and made America the great nation it is. Over the last 50 years, America has turned away from our foundation and we can see the impact on our nation because of it. We are lost, and our enemies see it. They believe because we stand for nothing, we are vulnerable. By failing to stand firm on our founding principles, we are inviting our own destruction and the lives and liberty of our children and grandchildren. There is nothing “loving” about this. This is not “tolerance” it is societal suicide. Lets honor our nation and all of the men and women who have sacrificed so much to defend it over the last few centuries by renewing our individual commitment to liberty and the moral standards that have made us the light on the hill for all the world. I’m often haunted since the emergence of ISIS by thoughts of precious Christian babies being beheaded by said perverted swine, and of some being buried alive; of long lines of largely young healthy men constrained and awaiting the same fate; of others being burned alive, or methodically drowned, in animal cages; of pre-teen boys being murdered for failing to fast; of pre-teen girls being ritually butchered in order to satiate yet another perverted demand by a demonstrable bloodthirsty lunatic called an “Imam”; of males being thrown to their death from rooftops consequent of a minority sexual preference, etcetera. So I endlessly ponder what it is that I can actually do to root out and destroy these vermin. Thus, with respect to said horrors, your founding-archives based 4th of July reminders of what and who we are as a people constitute not only inspiration – on stilts, but coming from an authentic American hero like you, who has voluntarily engaged in mortal combat on behalf of the country, both as a participant, and as a leader of other brave men, they also comprise both inspiration and a burgeoning belief that the day will come when the pitiable victims of said sub-human killers will be fittingly avenged by the millions of Americans et al who when the chips were finally down have consistently demonstrated a tendency to fight rather than knuckle under to tyranny whether at home or abroad. Thank your for that, and God bless America!